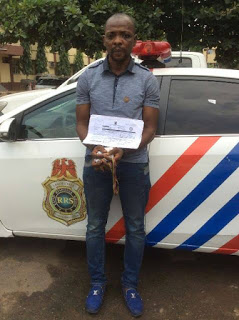 Olaitan Shofolahan, 37, a man arrested by the operatives of Rapid Response Squad of the Lagos State Police Command for impersonating officials of the Lagos State Land Use Charge has blamed unemployment as the cause of his action. Shofolahan, an Accounting graduate of Moshood Abiola Polytechnic, Abeokuta, Ogun State, was arrested on Thursday in Lekki Phase 1, in Eti-Osa Local Government Area of Lagos. He was arrested while attempting to defraud a resident of the posh estate of several millions Land Use Charge dues. It is with this code that you get an annual bill of the house and that you can get your charges printed out for you free with the bills. That was how I started moving round choice location to get their code and print their bills…. Any house that does not owe, I discard but those with huge bills, I work on them. But I noticed that some of them requested for my id–card. 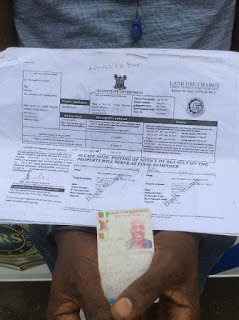 I forged a Lagos State Government identity card using a sample that I saw somewhere in Alausa Secretariat, Ikeja, he stated. He added, I have being in the business since February, 2015. I have observed that owners of buildings in Lekki have capacity to settle their bills quickly, that was why I have focused there. Unfortunately for me, it was this location that I was caught…. I entered the building in Lekki Phase 1, unknown to me that the officials of the Lagos State Land Use Charge were there with the house owner. I saw the owner discussing with them but I didn’t know their identity. The owner of the building after sitting me down, invited RRS officials to arrest me. Shofolahan explained further; “since I have been impersonating, I have only realised N30,000 which I collected from an home owner in Alausa while pretending to be an official of the State. I have not collected any other money apart from that. Each and every time I visited these buildings, they ask me to come back later”. Found with the suspect after his arrest were five land use bills with varied charges above N1 million and a forged identity card of The Lagos State Government. Confirming the incident, the Police PPRO, ASP Olarinde Famous Cole, said that there would be no hiding place for criminals in Lagos State adding that officers of the command are at alert to nip crime in the bud. The suspect has been transferred to the State Criminal Investigation Department, Panti, Yaba, for further investigations.